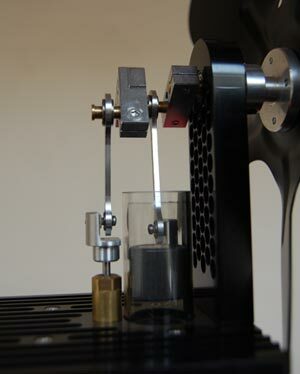 This Stirling Engine stove fan spreads heat from your stove into the room providing a more even heat. It is very common in the UK to have your stove recessed into a fireplace opening which can end up reducing the heat coming out into the room. The Stirling fan solves this problem very neatly. The Fan can be placed anywhere on the stove as they have been tested up to 550 degrees centigrade. The fan is driven by a Stirling Engine. The Stirling engine was invented in 1816 by Robert Stiling, a Scottsman.It relies on a fantastically simple principal: when air (or another gas) heats up it expands. This expansion pushes up a piston. This air then comes into contact with a top plate which cools it. It then contracts and pulls the piston down. The piston is fully visible inside its glass cylinder. No lubrication is needed, just sit it on your stove, give it a gentle push when the base is hot and it will start to spin, getting faster as the stove becomes hotter. As well as serving a very useful function the Stirling Stove fan is a lovely piece of engineering with the glass piston cylinder, stainless steel arms and beautifully made bearings and workings.